Studying under pressure is such a challenge for students in general, but when dyslexia is brought into the mix, it is so much harder to knuckle down and get that work or revision done. 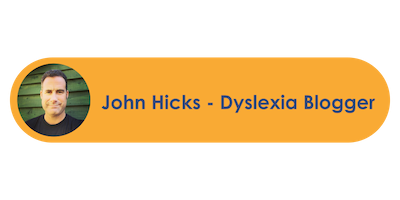 In this article, John Hicks will share five strategies that can help dyslexic students to focus their minds whilst studying. Do you have a favourite focus strategy? I want you to know that I am an expert in what de-focuses the mind. You could call me the king of procrastination. It would seem that as soon as I sit down with the best intention of doing some studying or revision (and yes whilst I am 47 this year, I am currently on a course and need to study so this is all real! ), it would seem that the ‘best intention bubble’ pops and I am looking for other things to do that will hold my attention. Am I lazy? Am I not committed to what I have to do in life? No! I am simply someone who struggles to process information in such a way that the impact of that information stimulates me to want to learn more. I have the attention span of a gnat and to be quite honest with you, it absolutely drives me nuts! So what I am going to suggest to you are five strategies that can be used to focus the mind when studying and they are all tried and tested by yours truly. Obviously I am not you and it may be that some of what I suggest doesn’t work for you, but that’s OK. Scroll down to see what I have to say and feel free to modify the strategies to work with you. Number 1 - Start the day as you mean to go on. OK, I am just going to put this out there. When I wake up in the morning, my alarm clock is my mobile phone. I have found that when I switch off that alarm, if I then start to check social media or start searching for content on my mobile phone before I do anything else, then my day is going to be full of distractions. Actually let me rephrase that, I will let distractions fill up my day. It is well known that screen content is a stimulus. That is why it is advised not to look at a screen late at night because the bright lights of the screen will stimulate your brain and stop you from sleeping. Well yes, but it stimulates the brain in the wrong way. In a recent article from Harvard University called “Dopamine, Smartphones & You” it is suggested that smartphone content increases the production of Dopamine in the brain which is the hormone that a lot of addictions try to generate. Dopamine makes us feel good, so we have more time on the smartphone checking our social media feeds trying to find that stimulus. The problem is that when you first wake up and start the day on your Dopamine breakfast via your smartphone, you not only start the day feeling dissatisfied but you have just wasted a load of time using up precious brain energy to process information. So when you come to study you are at a disadvantage. I know that if I start the day looking at internet content, I will have a hell of a job trying to focus on what I need to do. My brain is too hyped up. In many ways we as a society are addicted to internet content and notifications. In small doses it’s all good but when we can’t limit ourselves then we lower the chances of being able to focus. Number 2 - Switch off notifications on all your devices. Number 3 - Chunk your work. There is no such thing as an effective three hour study session! Number 4 - Don’t be a slave to your tech but make your tech be your slave. Number 5 - Try a little mindfulness.